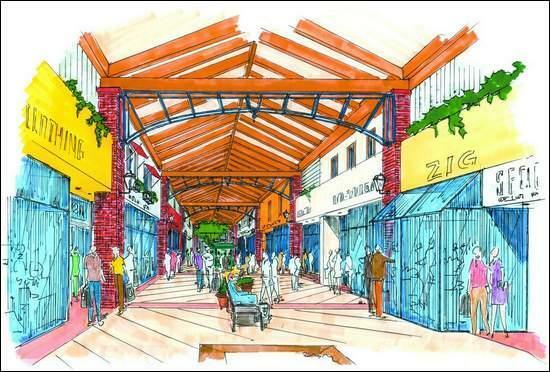 Two drawings of the proposed renovations to the Carson Mall have been released. They’re just abstract watercolors, so I’m sure things aren’t going to end up looking exactly like this. But it’s a good peek into the future of a mall that hasn’t changed much since it was built in 1964. These pictures were part of an article in the Nevada Appeal about how the owners are still planning to go ahead with the mall renovations, even though one of the recommendations from the Urban Planning Institute was to tear the mall down. The mall is always empty, so something definitely needs to happen, but if this renovation can reinvigorate the space, bring in a few stores that people actually want to shop at, and get foot traffic back inside the mall, I think it will have served its purpose. It’s a second chance that the Silver City Mall never got. It was torn down for a Lowe’s hardware store, that probably gets more visitors in one day than the Silver City Mall was able to pull in in a year. Right now the Carson Mall is irrelevant, but it’s going to take more than just new stucco and paint to reinvent it.